Wednesdays - Wear your sneakers for P.E. Box Tops - Keep sending in your box tops! Click here for more information! The November winner will be announced soon! As the holidays approach, Titus is once again collecting various food items for families in our community. Our annual Food Drive will run from November 10th - 21st. First graders are asked to bring in cranberry sauce, turkey gravy, and canned veggies. Please send the donations to school with your child. Every little bit goes a long way in giving our families a warm and happy holiday season. 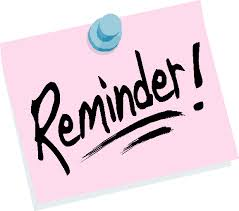 Fall parent/teacher conferences are being held on Monday, November 24th. Click here to view our conference sign-up sheet. Please make a note of your pre-selected time and plan to arrive about 5 minutes before your conference time. I am looking forward to discussing your child’s progress with you. 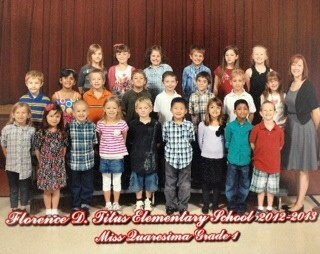 This Thanksgiving, I'm thankful for my wonderful class of first graders. I am lucky to teach and learn from each child in our class. I'm grateful to have such a fantastic group of parents who help and support our classroom. I appreciate all of the hard work you put in to help your child succeed and I share my deepest thanks for all that you do and all you have done to make this a successful and fun year in first grade. From my home to yours, I wish you and your family the Happiest Thanksgiving full of warmth and laughter. The Word Wall is a great writing tool in our classroom. I do not expect the students to memorize each word wall word, but they do need to be aware that the words are on the wall, so they can use them as a reference when writing in the classroom. You will see a sheet of word wall cards come home in your child's homework folder every Monday. Please practice these words with your child at home. Check the Word Wall section of our classroom website for a list of our word wall words. A list of spelling words came home today in your child’s homework folder. There will be 8 new spelling words each week including two more challenging words. The spelling words are chosen based on our Word Sort focus for the week. Check the Spelling section of our classroom website for a list of our spelling words. On our classroom website this week, I added links to the website Spelling City. This is a terrific site with some great games to help your child practice spelling while also having fun!! The most popular games are Hang Mouse and Word Unscramble. Check it out, here, and have fun spelling!! If you have an iPhone, iPod or iPad, there is a Spelling City app, too! Check out www.spellingcity.com/app for more information! In reading this week, we are reading a variety of Thanksgiving books. We'll start the week by reading We Gather Together, Now Please Get Lost. We'll discuss the importance of friendship and why we're thankful to have family and friends. Later this week, we will read and sequence the story One is a Feast for Mouse. We will discuss why it is important for authors to put story events in order. We'll also read Thanksgiving is for Giving Thanks. After reading, we will write sentences telling what we are thankful for. Our phonics focus this week will be identifying L blends such as: fl-, pl-, bl-, and –ld. Our shared reading focus this week is making predictions, inferences, connections to the text while reading. We will use what we already know before and during reading to help us better understand the story. When reading at home, be sure to talk to your child about what they are reading. Discuss the setting of the story including where and when the story took place. Have your child name the characters in the story. After reading, ask your child to retell the story details to you. At school, I ask the children to "close the book, start at the beginning, and tell me what happened in this story." Practicing this skill at home will help build your child's reading comprehension! In math this week, we will practice counting by 2s and 10s while reading thermometers. We will begin our study of measurement by measuring with non-standard measurements such as a hand-span, or our own personal feet. We will discuss why it is more difficult to measure with personal feet (everyone’s measurement is different because we all have different size feet). We will begin discussing measurements with a standard foot (ruler) and measuring to the nearest inch after the Thanksgiving break. The Unit 3 Math Test will come home in this week's Wednesday folder. Please sign and return your child's math test to school on Thursday. Remember, the majority of the skills on this assessment are still developing areas. You should not be alarmed if your child is still "Approaching the Standard" for any skills assessed in this unit. Last week we met and learned about our special school helpers Mrs. W-W, Mrs. Horan, Mr. Cashman, and Mr. Riley. Look for our school helpers books to come home in your child's homework folder. This week we will read about Squanto and the first Thanksgiving. We will write facts about Squanto and how he helped the Pilgrims during the first Thanksgiving. Look for our Squanto projects hanging in the halls next week! We are using a web-based program called XtraMath to increase speed and accuracy in arithmetic. Your child is invited to spend a few minutes each day practicing math on the computer. We will also be practicing each week in the computer lab and in the classroom. XtraMath is a great resource that offers your child individualized math fact practice. Please email me if you need your child's log-in information. Search the iTunes App Store for the XtraMath app too!! The app is great for those students who are still developing their skills using a computer mouse or keyboard. The Titus Home and School association has purchased a one year license for BrainPOP, which is a very interactive online source for virtually every subject and topic associated with our elementary curriculum. We are now able to access BrainPOP, BrainPOPjr, and BrainPOP Español for both home and school. In First Grade, we use the BrainPOPjr site at http://www.brainpopjr.com several times a week. Please visit the site with your children at home and encourage them to tell you about the activities we've completed in school. Check the Computer Lab Links page on our classroom website to find more fun learning games your child can practice at home.